Agronomy Corner - 2018 Year In Review - Mark Hershey Farms Inc. In my time working with our seed customers this past fall I’ve had the opportunity to scout fields late in the season and evaluate which hybrids and management practices are working or maybe need improvement. While looking at your crop late in the season may not give you many opportunities to improve the current crop, it’s a great opportunity to reflect on what went well and what didn’t that year, and put fresh ideas in your head about what to do on the next crop. With heavy rains from mid summer all the way through harvest, diseases, nitrogen loss and stalk health were some of the leading issues with this year’s corn crop. After harvest concluded, I began pulling soil tests in order to make plans for next season. After pulling samples and receiving results back, I am finding some trends that can help to explain some of this years issues, along with how certain fields handled the heavy precipitation better than others. I found that some fields that had standability issues tended to show lower levels of Potassium, (also referred to as Potash or K) in subsequent soil tests. While there were certainly exceptions to this rule, this season can serve as a good reminder that good crop nutrition, can help lead to healthier crops that manage risk better than crops that desire nutrients. Potassium is certainly one of these nutrients. In order to find if Potassium could be a problem on your farm, you need to pull a good set of soil samples from your fields to see if this is an issue. Using the soil test results from your fields, see where you stand on potassium levels. In some cases, Potassium levels might be high and you might only need to apply potassium sources in amounts to feed your current crop, or if you’re low you might considering adding in excess of what one crop would use in order to build levels of potassium in your field. Having high levels of potassium in your soils is mainly viewed as a good quality as K is fairly stable in the soil (not leaching or moving, like nitrogen) and having a high level will ensure that there is enough available at time when your crop needs it the most, without being a risk to the environment. There are several sources of potassium for your crop out there in many formulations, the most common is Muriate of Potash, which is between 60-62% potassium by weight. This is a dry product that can be spread on fields with a dry nutrient applicator or some products can be dissolved in water to be applied by a liquid applicator. Another product is known as potassium sulfate, typically 50% potassium by weight but also is 18% sulfur by weight which could be a viable option when sulfur is also needed for your crop, which in many cases it is. There are also several liquid products on the market to provide potassium to your crop. Consult with your fertilizer supplier to help you find the best fit for you at the best price PER UNIT of potassium, make sure you do this. Just because a product is cheaper, doesn’t mean you are getting same amount of potassium. Manure​ can also be used as a reliable source of potassium when used at adequate rates, although many farms use manure as a sole source of crop nutrients, fields many times begin to fall short on potassium over the years without applying potassium fertilizer. This is especially the case with poultry and swine manures. These manures will typically have good levels of both phosphorus and potassium, but your crops tend to remove much more potassium than phosphorus, moreso when corn fodder or silage is removed and also from a good soybean crop, and especially in double crop forage situations like rye silage/ corn silage. Thinking manure is always enough might not always be the case. This is another good argument for soil testing and seeing what you have and adding fertility where you may be short. Keep in mind that while manure may be a complete fertilizer, it is not a balanced fertilizer. 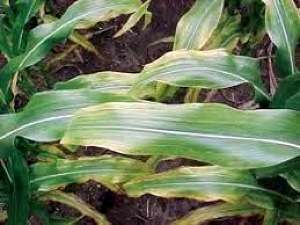 Pictured below are examples of a potassium deficiency of both corn and soybeans. 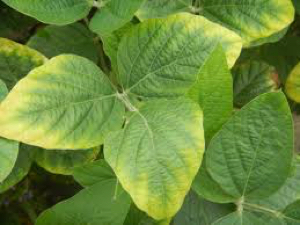 Seeing these in your crops are definitely a sign of being short of potassium, and can be slightly alleviated with foliar applications but once this observed yield has already been lost. Wishing you the best this upcoming season!